We moved into our c. 1970 Williamsburg Colonial 6 years ago. And while we were happy with the size and layout of the kitchen, we knew it would have to be our first major project. We spent time talking to friends and neighbors about their experiences and heard nightmares about projects being promised at 5 weeks and ending up being 3 months or more. On the advice of our daughter, we met with Rich Love owner of Chester County Kitchens and Baths, barely 10 minutes from our home in West Chester, PA.
We enjoyed meeting this bright, energetic young man. He came to see our kitchen and to listen to our ideas. 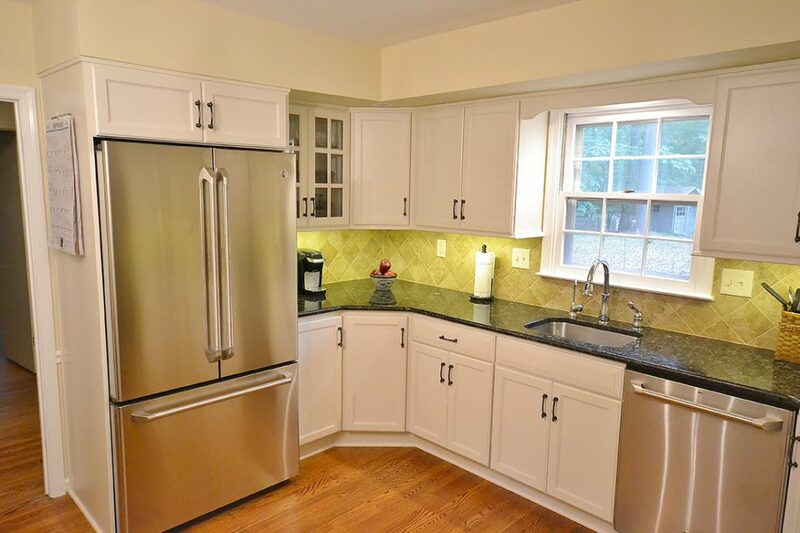 And while we liked the basic layout of our kitchen as well as the hardwood floor, we wanted to reconfigure the refrigerator to the opposite wall, away from it’s energy-wasting position next to the stove. Rich invited us to their showroom to choose the cabinets! We chose the Fieldstone (Made in America!) “Stratford” cabinet in a country Marshmallow Cream. And even before the project started, we were given several 2D computer schematics of our kitchen, a calendar with the work schedule and the detailed budget. 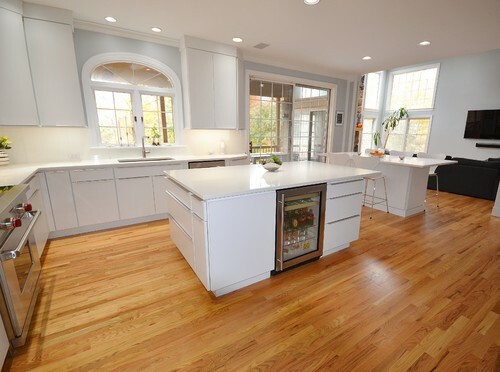 Rich gave us names of trusted purveyors all within 30 minutes of our home where we would choose our appliances (GE Café Series from Ferguson Showroom), granite countertops (Onur Marble and Granite) and tile backsplash (an Emil Ceramica design at Avalon Flooring). One of the bright stars at Chester County Kitchens and Baths is project director Stacy Nass, who coordinated all the deliveries to our home right on schedule. This is what separates Chester County Kitchen and Baths from other companies. On the day the project started, the dumpster was delivered to the end of our drive at 7:30AM, and by 8:45 the men were there to tear out the entire kitchen to the drywalls. The next morning the cabinets were delivered. The whole project went like clockwork anchored by Jim Martin and his son Dillon. And instead of the estimated five weeks, it was completed by the end of the third. 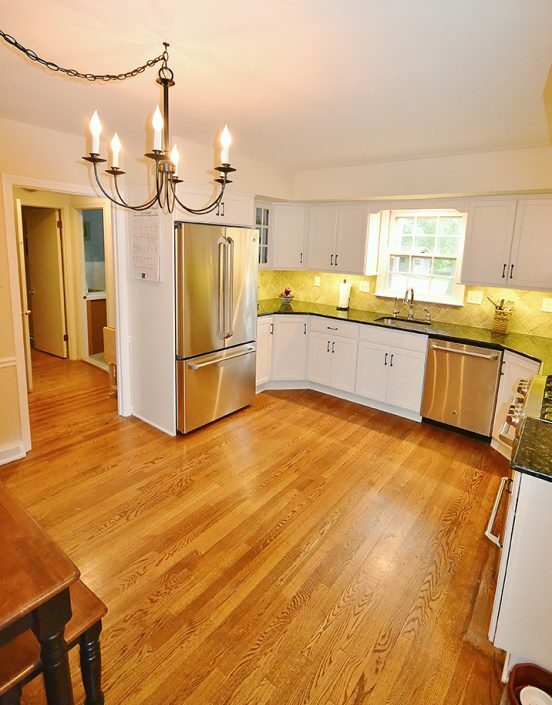 In addition, Chester County Kitchens and Baths painted our walls and trim to our specifications. Our neighbors have been amazed not only at the high level of workmanship, but by the quality of the cabinets, tile backsplash, granite counters and stainless appliances as well as how amazing the kitchen looks. Needless to say we love it, and are looking forward to working with Chester County Kitchens and Baths again for our “1970’s Avocado Green” downstairs bathroom re-do. 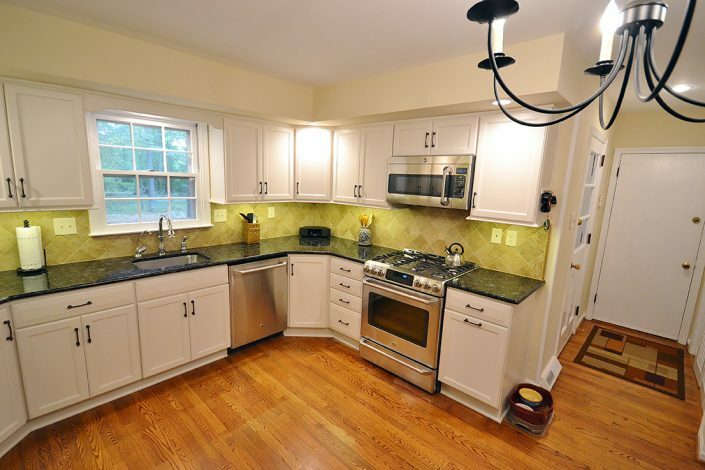 Gorgeous, bright and roomy kitchen remodel. This project was a simple renovation of a small kitchen. 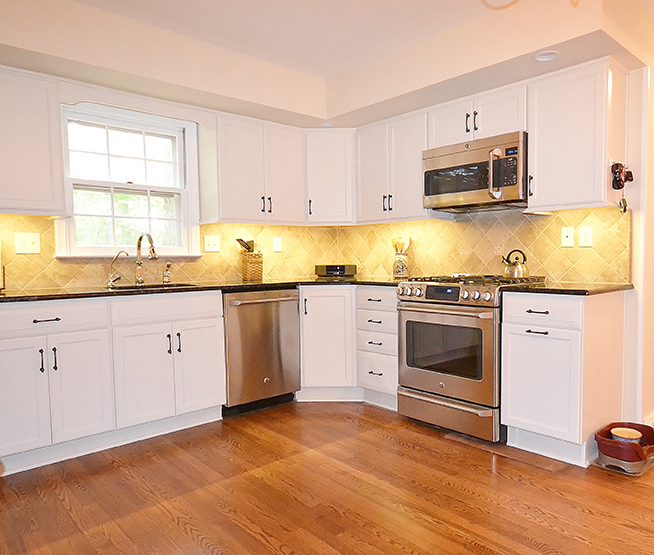 The new Fieldstone Cabinetry in a white painted finish gives the new kitchen a brighter feel. Just a few minor relocations of the appliances gives the new design a bigger more spacious feel. The Volga Blue granite countertops add a nice contrast to the new look. New stainless steel GE Café appliances really bring the kitchen up to date. Another kitchen past its prime renovated to a new clean, bright, revived space.